The Minamata Convention on Mercury, adopted in 2013, is a world-wide treaty aimed at protecting human health and the environment from mercury’s harmful effects. As the artisanal and small-scale gold mining (ASGM) sector is a major anthropogenic source of mercury release and environmental pollution, a specific article targets the sector in the treaty; as per Article 7, countries that are part of the Convention and determine that ASGM and processing are “more than insignificant” in their territory shall develop a National Action Plan (NAP) to reduce, and where feasible, eliminate the use of mercury and mercury compounds in the sector. The Artisanal Gold Council (AGC) is helping countries, such as Burkina Faso, Ecuador, Gabon, Laos PDR, Mali, Peru and Senegal, to elaborate their NAP, in collaboration with the national governments, the Global Environment Facility (GEF), the United Nations Environment (UN Environment) and the United Nations Industrial Development Organization (UNIDO). 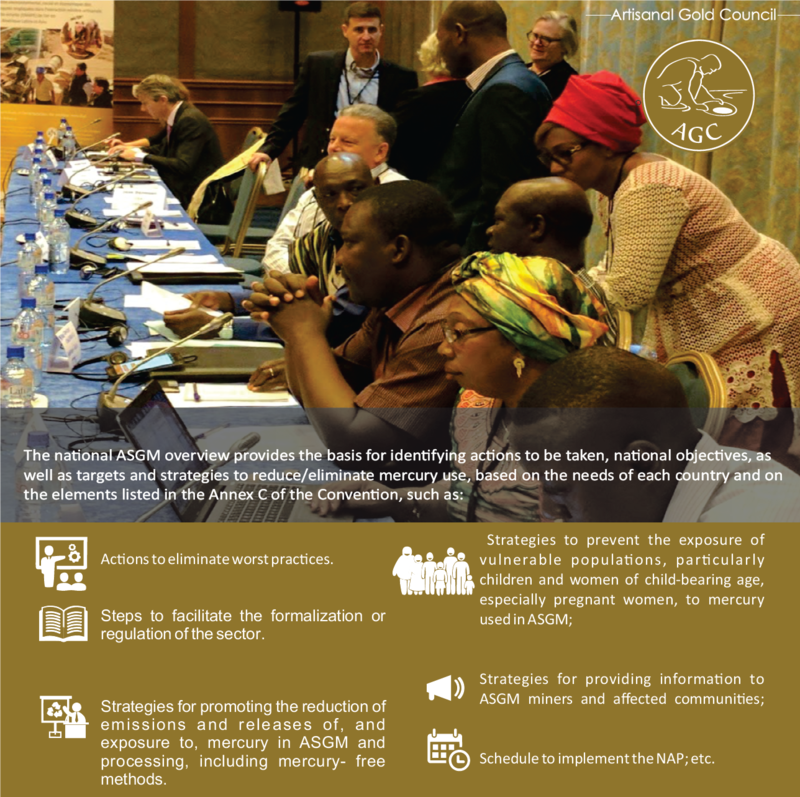 As part of the NAP elaboration, the AGC assists countries to develop a national overview of the ASGM sector, including a baseline estimates of mercury use and mining practices. Under this component, AGC provides training to national experts on the methodology used to prepare a mercury inventory for the ASGM sector. The national objectives and strategies are defined in consultation with local, regional and national governments, as well as other ASGM stakeholders such as miners, the civil society and academia, through workshops and meetings. During the elaboration of the NAP, the AGC also supports countries to improve the health of miners and ASGM communities by developing a public health strategy for the sector based on the assessment of the health situation of miners and their communities, as well as on the assessment of the institutional capacity of the health sector. Awareness is also raised during the project on the risks related to mercury use in ASGM to human health and the environment. The AGC has several NAP project on the go and many more pending. Click here for an updated review of the NAPs we are working on.